Yesterday I decided that there was hope for the future when we supported young people who are dear to us to live frugal and self sufficient lives. The first pic is of EGD and her boyfriend (EGDB!) 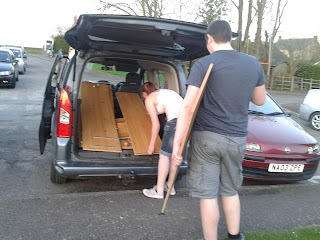 loading a wardrobe they had just bought second hand, along with 2 bedside tables and a chest of drawers. 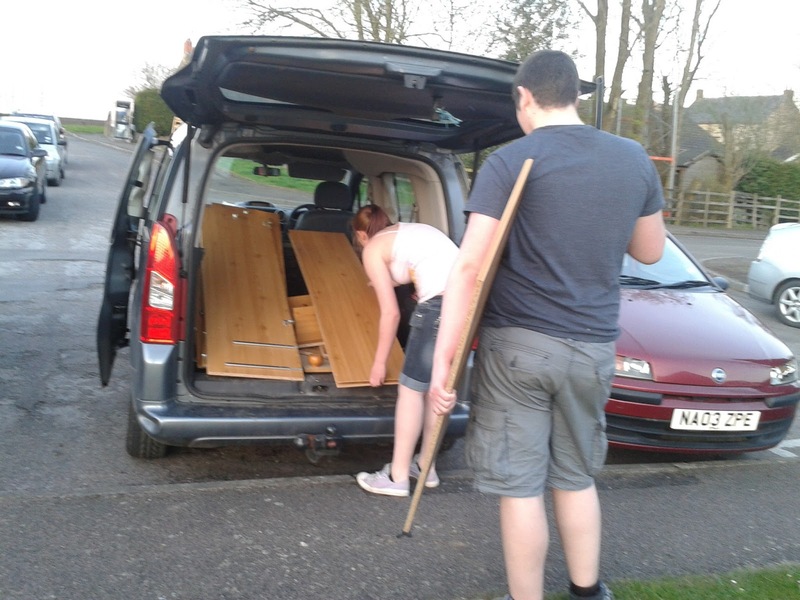 They will soon be moving into their first home and have been sourcing some very good deals to furnish and equip it. So many of their contemporaries want new and matching and perfect and "ideal homes" immediately and paid for by credit card. This young couple have saved and paid cash for everything. They have happily accepted stuff that family and friends have offered, even if it doesn't match perfectly. "It'll do to start us off won't it"? The next pic, which looks remarkably like the old Persil advert! is of D going through Gdson's newly acquired hive (Remember Gdson ? - he of the Ox Hearts and rotivator!). He bought this hive from someone who was bereaved of the person who kept the bees. They hadn't been touched for over two years and he was unsure of what he might find. So he asked his Uncle D, who has kept bees for over 40 years to go through them with him. Looking on is Gdson's father, who is very keen on the bees, which is fortunate as they are being kept in his garden! Gdson has taken patterns from the old dilapidated hive and, with his dad, is merrily making new parts. He has made extras and reckons that he will sell some to pay for his expenditure. Nice one! My friend and neighbour keeps bees, I never realised how fascinating they are! yes they are absolutely fascinating. I could sit for hours just watching them and when you start to handle them you realise just what incredible creatures they are. And of course essential to humans too !